There is no options to select my FB page. Appreciate your advice on how should I proceed. 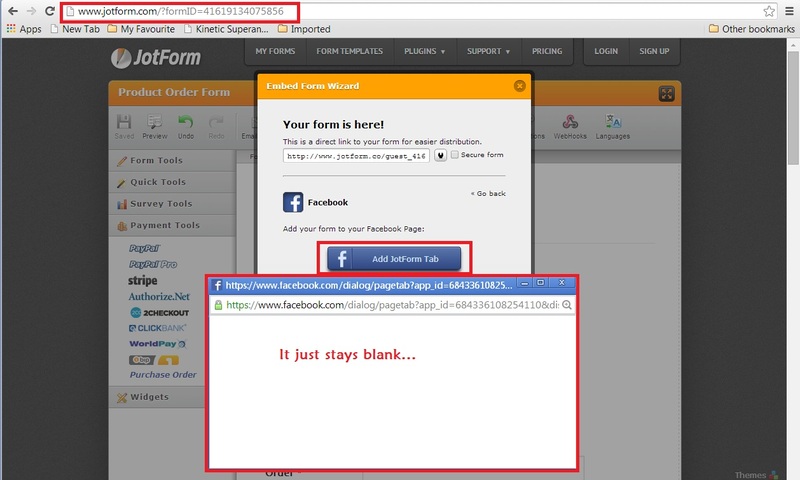 Kindly log in to facebook on a separate tab then try to click the Add JotForm tab again. I also want to remind you that you are using a guest account. Your form submission may be limited to 20 submissions per month. Let us know if you were able to add jotform to your facebook page. I've signed up for an account and was then able to add the JotForm tab to my FB page after logging in to my Jotform account. The form appears under the "Contact Us" tab in my FB tab. Just wonder if I can customize or change the label to other words, like "Place An Order" instead of "Contact Us"? Or is it controlled by FB settings?